Nadi in Sanskrit means the pulse, the subtle channels in the body, a division of time (24 minutes). In Tamil, the language of Tamil Nadu, Nadi means in search of. To be in search of the past, the reason of existence, to search the roots and essence of the past. In Yoga and Ayurveda, Nadi are the subtle channels that give message to the different parts of the body plus the Ida, Pingala and Sushumna nadi. Grantha is a great book of knowledge. Nadi Granthas or the great books of subtle knowledge, are recordings of the Sapta Rishi. Sapta means seven and Rishi means Sages. Brahma conceived the Seven Great Sages out of his mind to help in his creation of the world. They were Bhrigu, Angira, Atri, Vishvamitra, Kashyapa, Vashishta, and Agastya. They knew the key to creation and the destiny of each and every individual born and yet to be born. What is their purpose? Why they were born? What karma they bring into their life? These Granthas were not written as predictions but as records of life and information on secret knowledge. This knowledge was not restricted to astrology alone but to other subjects including Science, Ayurveda, Yoga, Spirituality, Alchemy, Occult and Jyotisha. Their thoughts and knowledge was passed down orally from one generation to another and then finally written down on palm leafs. They were originally in Sanskrit but they also got translated into Tamil, Telegu, Malayalam and other regional languages. A collection of palm leafs become one chapter within a Granthas. So a complete Grantha could be many thousands of palm leafs. The Nadis are equivalent to books today. The only difference is that Nadis are only filled with profound knowledge and the keys to existence on all levels- practical, spiritual and subtle. The knowledge within these Nadis is pure and profound. The mind of the interpreter may not be able to grasp the great information that the Sages are trying to impart and therefore bring the reading down to a more material level. The records were kept in many libraries in ancient India. For centuries few realized the importance of these records and the nadi manuscripts were left to rot. Under the patronage of the Chola Dynasty that ruled South India from 10th to 13th Century AD, the leafs were classified and kept in the library of Thanjavur, Tamil Nadu. Other kings around India also helped in the preservation of these Nadi granthas as well. Many of these leafs were destroyed by the invading armies of the Mughals and the British. While the Mughals asked them to be burnt, British took numerous Nadi back to Britain but they sold most connected to astrology. 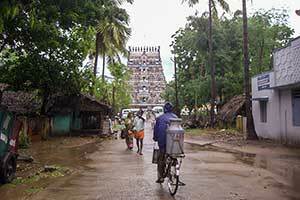 Valluvar community from Vaitheeswaran Koil in Tamil Nadu chiefly bought there. This is why most of the Nadis today are connected to astrology. Each Nadi in Tamil Nadu is made up of ola or palm leaf, written in Vatta ezhuthu, a Tamil script, with a sharp, pen like instrument called ezhuthani. Rubbing peacock oil on auspicious occasions preserves the palm leaves. Peacock is also the vehicle for Murughun (Mars). So the subtle hint is that the great Lord Murughun helps preserve and protect this ancient knowledge. This is why there are so many Nadi readers outside one of Mars’s main places of power in Vaitheeswaran Koil. There are other centre of Nadis. In Hoshiarpur, Punjab, a family og Bhrigu nadi readers are found. There are many centres of Nadi in India. The main one remains in Vaitheeswaran Koil in Tamil Nadu. Due to the patronage of the Chola kings, Nadi Granthas were translated and kept in the library at Thanjavur, which is near Vaitheeswaran Koil. When the British sold them, most of these came to be in Vaitheeswaran Koil, where the Pullirukkuvelur Temple is dedicated to the healing powers of Shiva. Unlike most other temples that are known by the presiding deity, Lord Murughan is a celebrated deity in Vaitheeswaran Koil. Murughan is the son of Shiva, therefore comes from the same lineage. The Nadi Jyotisha flourishes under the protection of Shiva and Murughan. They ply their traditional trade interpreting the knowledge of the Nadis and also telling of the upayes or remedies for the past karma. One should go for a Nadi reading with devotion. If you are skeptical about them, it is likely to bring you face to face with the wrong interpreter. There are many texts of Nadi Jyotisha. Some give obscure and often secret techniques of Vedic Astrology. They give the key to precise interpretation. Among them include Bhrighu Nandi nadi, Bhrighu nadi, Chandra Kala Nadi, Sapta Rishi Nadi etc. The Nadi readers are not astrologers but decoders of ancient scriptures. All they are doing is deciphering the data. His skills are limited to reading what is written. If the nadi leafs are incomplete or he has not found the right nadi or the time is not correct for you, then this information cannot be right. In fact the time has to be right for the individual to get the right nadi. This information is very precious and not everyone is ready to receive it. This is the reason so many get the wrong or incomplete information. The Rishis had only wanted those who were ready to receive information, to get it. In essence it is not the fault of the Nadi or the reader if you do not get the right information that chronicles the past, present and future. Nadi reader tries to find the right Nadi by taking the thumb impression. According to the Nadi Granthas there are 1008 types of thumb impressions and these will narrow down the batch of Nadis where the story of your life is told. The impression of the right thumb for men and the left one for women is taken. The thumbprint has to match the particular batch of palm leafs for the reading to take place. Despite the claims of the nadi readers, it is impossible to find the right nadi for everyone. These Jyotish Nadis Granthas divide the information on each individual life into sixteen chapters or kandams. Each chapter shows various aspects of life similar to the horoscope and its twelve houses. But there are added kandams, which are the real key of the Nadi reading. profession and general list of future predictions for all the 12 houses. Kandam 2– similar to second house. Money ,family speech, eyes, education, vision. Kandam 3- similar to third house. Brothers and Sisters. Kandam 4- similar to fourth house. Mother ,House, Lands, Vehicles, Happiness. Kandam 5- similar to fifth house. Children, birth of children, reasons for not having children, creativity. Kandam 6- similar to sixth house. Enemies, Diseases, Debts, cases in court. Kandam 7- similar to seventh house. Marriage, Married life, problems nad blessing from marriage. Kandam 8- similar to eighth house. Danger to life, longevity, period of death. Kandam 9- similar to ninth house. Father, Wealth, luck, Temple, spirituality, devotion to God and Guru. Kandam 10- similar to tenth house. Business, Job, Profession, success. Kandam 11 - similar to eleventh house. Profit, money, gain, second Marriage. Kandam 12- similar to Twelfth house. Expenditure, loss, Foreign travel, moksha, self realisation, next birth. After the twelve kandams that relate to the twelve astrology houses, there come special chapters that deal with additional aspects of life. Kandam 13- Shanti Kandam – Shanti means peace. This chapters deals with pacifying the past life issues, past karma and last birth. The remedial measures that need to be done in order to calm the negative karma. This is the most important Kandam. By rectifying the past life allows us to live in the present with happiness and peace. But this is also the Kandam people have the greatest problem with, as it is open to abuse by the unscrupulous Nadi practitioners. Do remember that not all Nadi Readers are corrupt and unscrupulous. They usually are very dharmic following their family tradition faithfully. As rectifying the past life is essential to move forward, it does not have to be done through expensive pujas and rituals if the individual cannot afford them. TheRishis could not have thought that only the wealthy who can afford these rituals, would the only ones who are relieved of their past karmas. This cannot be right. But the onus falls on the individual to make effort to clear his wrong karma once they gets aware of the issues they have collected in the past. It is important to appeasement the deities and work with the remedies. Without working with this essential aspect of the Nadi reading, there is unlikely to bring any lasting benefit. While the other kandams give knowledge of past life and what is going to happen now. We are not able to enjoy the future properly without sorting out the baggage of past karma. Kandam 14– Diksha Kandam- Diksha means initiation. Here it refers to initiation into secret knowledge that allows the deeper world to develop through the use of the right mantras and the right protection. To get the right diksha, the individual has to be willing to clear the past karma revealed in the shanti kandam. Kandam 15– Aushadha kandam. Aushadha means herbs, in this case medicine. This kandam deals with health and healing. Kandam 16- Dasa Bhukti kandam. This Kandam 16- Dasa Bhukti kandam. This is Nadi version of the dasa and bhuktis for life. In addition to these, there is also a special chapter for Prasna. The reader answers the questions from what is written by the Rishis. The nadi reader does not give these answers through traditional prashna astrology. What one must understand it that Nadi is a very ancient science. And it should not be misused. Only those with a great desire to know their past and future should go, with the right attitude and devotion. Otherwise it is not possible for them to receive the good results. Also if you do go to the home of Nadi in Vaitheshwaran or to a good Nadi reader elsewhere and do not receive the right reading, then it is also part of your karma too. Don’t blame the reader. The time may not have been right for you as yet. You may have to try again at a later date.